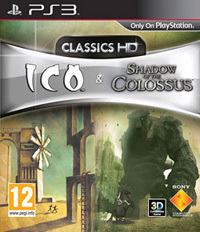 A remastered version of the cult action game Shadow of the Colossus from 2005, designed for PlayStation 3. Shadow of the Colossus HD is a remastered version of the cult action game that hit PlayStation 2 in 2005. The production was created with PS3 platform in mind and was developed by Bluepoint Games studio. The game is available as a separate item (in digital distribution) and as part of the Team ICO Collection (also in a box). In Shadow of the Colossus the player takes on the role of Wander, a young man trying to bring back to life a girl named Mono, dedicated to a mysterious ritual. In order to accomplish his intentions, the hero crosses the borders of a Forbidden Land separated from the rest of the world and enters into a pact with a dark force known as Dormin. It turns out that there is a possibility of resurrection of his beloved - but for this to happen, the protagonist must annihilate the sixteen title Colossuses, creatures resembling gigantic, animated statues. With only a sword and a bow at his disposal, the heros sets off on a dangerous journey in the company of the faithful Agro horse. In Shadow of the Colossus HD, released on PS3 platform, we observe the action from a third party perspective (TPP). The foundation of the game is the exploration of a vast, open world (which consists of desert, the ruins of ancient buildings or even a forest and picturesque valley) and the fight against the sixteen title Colossus. The selected target should be tracked down using a light-emitting sword wedge (a narrow column means that there is an opponent in this direction) and reach it. After winning, Wander wakes up in the temple, where he accepts Dormin's task of annihilating another opponent. The fights take place in real time and in different sceneries (on land, in water, in the skies). Individual enemies differ not only in appearance and size, but also in their individual characteristics and weaknesses, on the basis of which tactics should be developed. While some Colossuses walk majestically on the surface or fly calmly in the air and do not attack unprovoked, others behave more chaotic and aggressive. The latter is especially the case when Wander climbs over their furry parts of the body (in order to avoid a painful fall, pay attention to the endurance indicator, as the hero hanging on his hands, quickly falls off his strength), trying to reach one of the weak points - such a one should stab with a sword several times to weaken a mighty enemy. Often the protagonist is also forced to use the help of Agro - the mount is a real support on the battlefield, because it can distract the opponent's attention (for this purpose we can also use a bow) and allows him to get to hard to reach places, from which, for example, we jump on the back of the Colossus. At the same time, the creators tried to bestow on him the characteristics of a real animal, so that our companion sometimes refuses to obey, and in a situation of direct danger, he is forced to flee. After the completion of the feature mode, the player has two further variants of the game at his disposal. In addition to the additional difficulty level (Hard), Time Attack module is waiting for a check, where we are measuring the next Colosses on time. Compared to the original PS3 Shadow of the Colossus HD platform, it boasts a refreshed visual layer - the higher quality of the graphics guaranteed a boost in resolution to 1080p; moreover, production uses stereoscopic 3D technology (although only the owners of appropriate TVs can enjoy it). In addition, developers have prepared a set of trophies for the player. Game score 9.0 / 10 calculated out of 50 players' votes.